The surveys were conducted from January to April 2008 and from March to June 2009 for the reporting periods of FY2007 and FY2008 respectively. 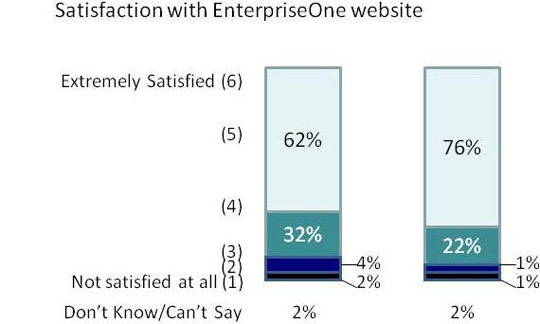 To determine the level of satisfaction with regards to the EnterpriseOne website (www.enterpriseone.gov.sg) and Government e-Services. 3 out of 4 businesses (75% in FY2007 and 74% in FY2008) obtained information from the Government in the past 12 months. 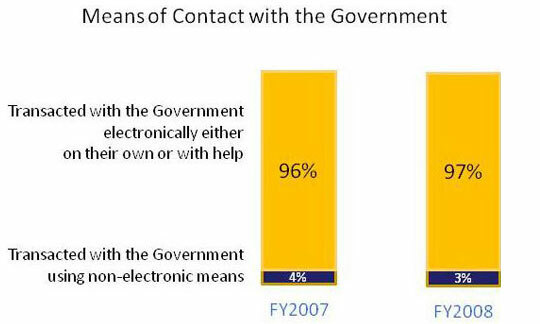 More than 9 out of 10 businesses (96% in FY2007 and 97% in FY2008) that obtained information from the Government did so electronically (via the Internet, automated kiosks, email, telephone via the Interactive Voice Recognition System, SMS, etc. ), at least once in the past 12 months. 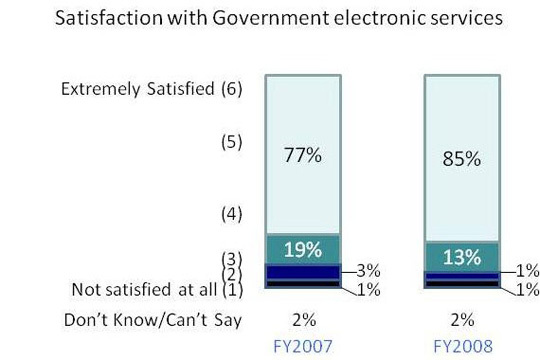 An increasing number of businesses (from 62% in FY2007 to 76% in FY2008) that had visited the EnterpriseOne website (www.enterpriseone.gov.sg) were satisfied with the overall quality of the Government information found on the website. 9 out of 10 businesses (93% in both FY2007 and FY2008) transacted with the Government in the past 12 months. 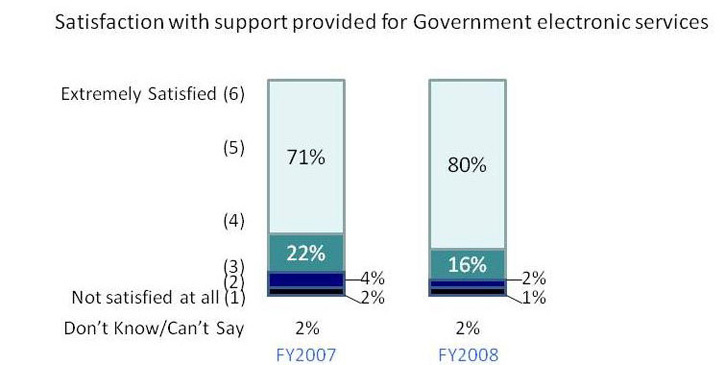 Among the businesses that transacted with the Government in the 12 months preceding the survey, 9 out of 10 businesses (96% in FY2007 and 97% in FY2008) did so electronically (via the Internet, automated kiosks, email, telephone via the Interactive Voice Recognition System, SMS, etc. ), either on their own or with help from intermediaries, at least once in the past 12 months. Note: FY2007 refers to the period from 1 April 2007 to 31 March 2008. FY2008 refers to the period from 1 April 2008 to 31 March 2009.